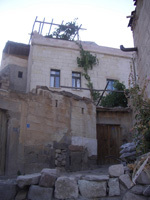 Planning a trip to Cappadocia? Take a look at this house! The Turkish language is vastly different from Indo-European languages like our native Dutch and English, or the ones we learn at school like German and French. It probably belongs to the Altaic language family and shares many characteristics with Mongolian, Korean and Japanese in it's structure. Thus, Turkish grammar deviates strongly from what we are used to, which makes it harder to master than most other popular foreign languages (at first). Turkish grammar however, is one of clearest and most regular of all languages in the world; it has only six irregular verbs in the present tense. All Turkish verbs end on -mek or -mak. Scrap those and you get the stem. There are not many words you will recognize in Turkish. There are a number of French words you will recognize, like şoför, asansör, akvaryum, milyoner, and a few Turkish words that made their way into English; like yoğurt. It is easier to recognize these after learning the pronunciation of the Turkish alphabet. Many Persian, Arabic and Greek loanwords entered into Turkish during the past 1000 years of cultural exchange, but most of them were replaced with Turkic synonyms or cognates by Ataturk, who also officialy changed the writing system to the Latin alphabet. Read more about the Turkic languages on the English Wikipedia. The Turkish language can be of use in a much wider area than just in Turkey. It is also spoken in the Balkans by minorities and as a second language, most notably in Bosnia, Kosovo, Macedonia, Albania and parts of Greece and Bulgaria. The closest language to Turkish is Azeri, which is spoken in Azerbaijan and north-western Iran, and is almost completely mutually intelligible for native Turkish speakers. Together with Turkmen, these form the Oghuz group of the Turkic languages. Through satellite television and the internet, some modern "Istanbul-Turkish" has found it's way to Central-Asia, so there is a large chance you will be understood by the many youth that received Turkish education in one of the larger cities like Astana, Tashkent or Bishkek, but their dialect of Turkic is vastly different from modern Turkish. Turkish is not an easy language to learn. In order to master it, you will need to delve into it's grammar, keep practising at it and use the language in daily life. You will be greatly rewarded by Turks both in Europe as in Turkey and elsewhere. If you have become interested, please contact me to make an appointment to meet and discuss your aspirations!